Any Battle Damage your opponent takes from battles involving this card becomes 0. Once per turn: You can target 1 Effect Monster in your Graveyard; banish that target, and if you do, until the End Phase, this card’s name and ATK become that monster’s name and ATK, and it gains that monster’s effects. You must control this face-up card to activate and to resolve this effect. We end this week off looking at an interesting card that can help make use of some interesting strategies, Phantom of Chaos. Phantom of Chaos is a Level 4 DARK Fiend with 0 ATK and DEF. Terrible stats, but Phantom of Chaos has a way to fix that. DARK and Fiend are good if you cannot tell already. Any Battle Damage your opponent would take from battles involving this card becomes 0, so you know this thing can get some crazy ATK easily. 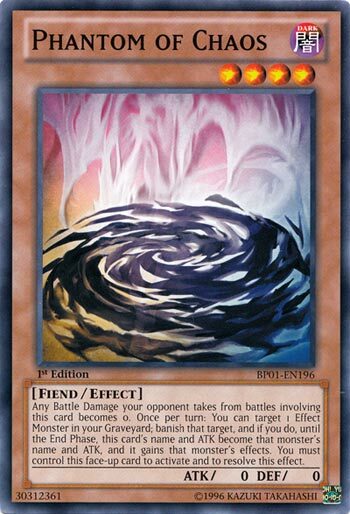 Once per turn, you can banish an Effect Monster out of your GY and until the End Phase, this card’s name becomes that card’s name, gains the ATK that monster has, and gains that monster’s effects. You must control this card and let it remain on the field to activate and resolve this effect, though I don’t really know how necessary that clause is. This is an interesting card as it can help players summon the Sacred Beast Fusion by banishing the three Sacred Beasts: Raviel, Hamon, and Uria. I have also seen this be used to help get Sky Scourge Noraleas off with greater ease. This card does have interesting uses. Nothing to likely be meta ever, but some fun stuff nonetheless. It is a fun card to mess around with to get off effects that are otherwise hard to pull out. Art: 3.5/5 Lazy, but cool nonetheless. Phantom of Chaos…I feel like this card has some serious potential. However, the Ex Minion of Darkness in me sees one fatal flaw in this card, the last text on this card, how you have to control it (face-up, and that’s not even the part that worries me) to activate and resolve the effect. So let’s forget (just for an instant) what this card can do with its seeming sweet absorbing power…your opponent can watch and see, and if seriously feeling threatened, all they have to do is chain removal, destruction, banish, whatever…and just like that, you get nothing from this card. I feel like that’s a real killer. Plus, I feel the perfect time for that to happen is after you remove a Monster, cause then, you’re losing two cards (this, and what you all ready removed) essentially making this a -2. What it does, does seem useful enough, I just don’t feel it’ll be successful often enough to make playing worthwhile. Phantom of Chaos is our Friday Card. It’s a Level 4 Dark Fiend-type monster with 0 Atk and 0 Def. But the reality of this card is that it can be and do almost anything. It will never do any battle damage to the opponent, but it’s the effect that matters. You can banish a targeted monster from your grave to gain the name, Atk, and effects of that monster until the End Phase. The potential for this card is near limitless. No matter what kind of new monster comes out, this will be able to copy some aspect of it. Phantom of Chaos might not be a game winner on its own, but every now and then some broken combo comes out where this card shines.